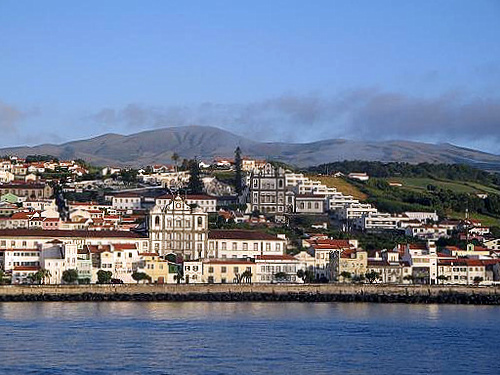 Faial Island is an island east of Pico and part of the central group of islands in the Azores. Faial is nicknamed the “Blue Island” due to the large number of hydrangeas that bloom in the summer months. But the island is much more than just flowers. 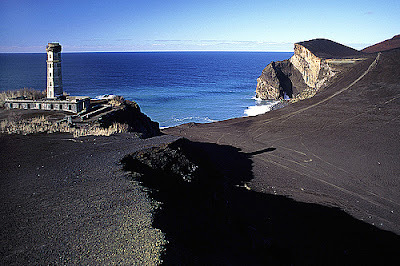 Faial happens to be dominated by a volcanic cone, at the top of which lies a deep crater about 400 meters in depth covered with vegetation ranging from cedars and junipers to beeches, ferns, and moss. A series of grottoes and marine caverns are also located along various parts of the island’s coast. And, of course, you’ll find the white town houses, ochre fort walls, sheltered inlets, and soft sandy beaches that seem to characterize all islands in the Azores. Faial’s history is rather murky. According to legend, the first inhabitant on the island was a hermit who took refuge on Faial to escape the world and its temptations. Some time afterwards, a group of settlers arrived on the island from Portugal. Not too long later, Josse van Huerter, a wealthy Flemish, mistakenly landed on the island and was so enamored by its beauty, that he sought the assistance of King Joao I of Portugal’s daughter to obtain a grant in 1468, which named him donee of the island. With this grant, Van Huerter brought several more of his countrymen from Flanders who settled in the parish of Flamengos. 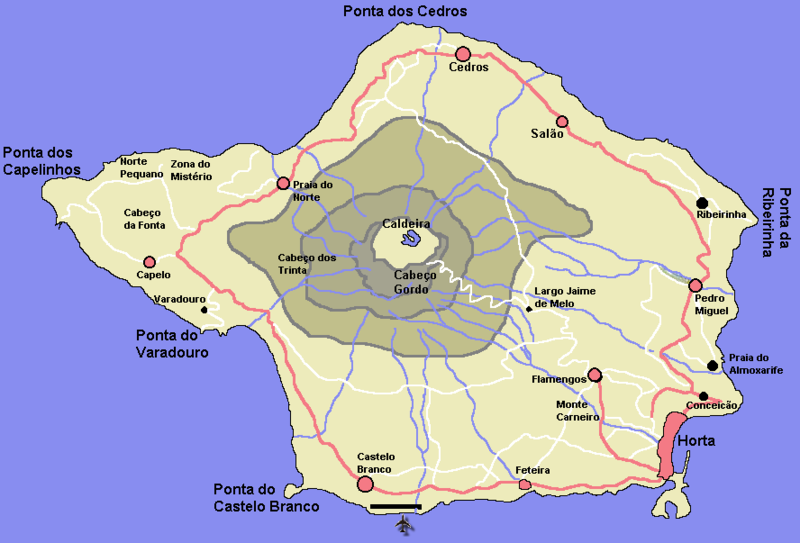 Unfortunately, Faial Island was struck hard by misfortune in the ensuing centuries. In 1583, the Spanish conquered the island. Soon afterwards, English privateers attacked Faial, causing significant damage. In 1672, an earthquake also rocked the island. 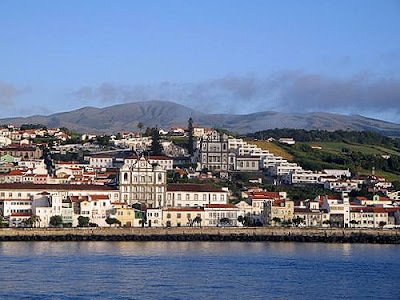 But the 19th century brought a reversal of fortune for Faial; its port became an important center for the orange trade and the whaling industry. After the whaling industry died out, the island returned to its roots, today relying primarily on agriculture, dairy, and fishing. 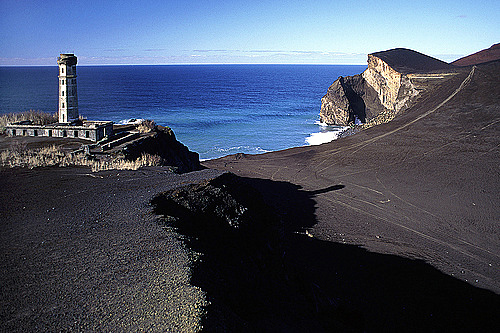 Faial features a number of notable tourist attractions; the Capelinhos is its most popular. The Capelinhos is a volcano on the western region of Faial. An eruption in 1957 enlarged the land by about two square miles, developing Ponta dos Capelinhos. The event was marked by more than 300 explosions and earthquakes. The lighthouse at Capelinhos is situated near the cliff of the cape and marks the old position of Ponta dos Capelinhos before the eruption enlarged the land. More than 300 houses and crop fields were buried by the catastrophe. The Monte Guia volcanic peak is another oft-visited site, a lookout point with magnificent views of the city of Horta, the beaches of Porto Pim, the coast of Ponta de Castelo Branco, and the island of Pico. The lookout point is actually a protected natural reserve because of the unique flora and fauna surrounding the area. The great crater of Caldeira, at 400 meters deep and 2 kilometers wide, is equally acclaimed by visitors for its fantastic views. At the crater’s bottom, you’ll find a beautiful lagoon surrounded by blue hydrangeas, green ferns, and zimbro and beechwood trees. So beautiful and unique, Caldeira has been classified a natural reserve. Faial’s natural beauty makes the island a perfect destination for nature lovers and explorers. But there is plenty to see and do for the more active visitors as well. If cave-exploring and volcano-hiking is not enough, the beaches of Faial – Porto Pim, Praia do Almoxarife, Faja da Praia do Norte, Varadouro, and Castelo Branco – all offer natural pools and ocean fronts for swimming, yachting, surfing, windsurfing, snorkeling, diving, and sailing. Faial’s festivals are also an exciting attraction for tourists. The Semana do Mar or Sea Week festival in August has become a major international event. This event celebrates water sports and offers various sea-related activities. During this week-long festival, music and ethnographic groups from Portugal and other islands also come together to entertain the masses with cultural shows and performances. Other festivals held in Faial include the Festival of Our Lady of Concerns, the Festival of Saint John, and the Festival of the Holy Ghost. These religious celebrations are quite the experience, even for the secularly-inclined. Nice article. Faial Island is a Portuguese island, Pico Island is the nearest to Faial island. Horta is a single city in the western part of the Azores. Porto Pim is one of the most beautiful beaches. You can enjoy Swimming, Various types of marine mammals and birds around the beach. You can see Cabecao Gordo mountain, Guia Hill, Horta and Scrimshaw Museum, Parque da Algoa or public park. Near Porto Pim there are hotels such as Quinta do Canario, Hotel S Jorge Garden, Quinta do Canavial.